​ACCORDION METHOD: A Method for managing change in which: (a) planning and implementation are conducted in parallel, and (b) the duration of the change is expanded or contracted according to the urgency of the challenge. AD HOC MANAGEMENT: A management process in which response to challenges is a systematic but without reference to an overall plan or strategy (see Organic Adaptation, Planned Management). (b) timeliness of introduction of new products/services. BUSINESS STRATEGY: A strategy of the firm addressed to optimizing its financial performance. CAPABILITY: (Firms’ or managers') motivation, competence, capacity to manage change. Functional Capability of the firm’s functions, e.g. marketing, R.& D., personnel. General Management Capability of the units charged with general management responsibility. Organizational: the predisposition and the ability of a firm to engage in a particular type of behavior. Vector Attributes of capability: managers, climate, competence, capacity. CAPACITY: Part of the capability vector. The volume of work which can be handled by an organizational unit per unit of time. CASH COW: An SBA in which the firm minimizes investment and maximizes cash flow to other SBAs. CRITICAL MASS: ls the level of strategic investment in an SBA, which results in 0 profitability. CRITICAL SUCCESS FACTOR: An element of the competitive posture which is essential for success in an SBA. CULTURAL-POLITICAL FIELD: A map of the probable support/resistance which groups/individuals are expected to exhibit toward change. (a) A perception of the critical success factors shared by a unit of the firm. (b) The social norms and values which support critical success factors. DEMAND LIFE CYCLE: Curve of the evolution of demand in an SBA overtime. DEMAND-TECHNOLOGY LIFE CYCLE: A curve of evolution of demand in an SBA for products/services based on a particular technology. DISCONTINUITY: An event which cannot be predicted by extrapolation of a series of preceding events. DISCONTINUOUS CHANGE: A change which cannot be handled by the historical capability of the firm. DISPERSED POSITIONING: A method for positioning of ern SBA in a BCG or McKinsey matrix in a way which shows differences in predictability of events in the SBAs. (see Point Positioning). DOWNSTREAM COUPLING: Degree of involvement of research and development, production and marketing functions of the firm in each stage of a new product development project. DUAL BUDGETING: Preparation of separate operating and strategic budgets during a firm's budgeting process. INSTITUTIONALIZATION OF CHIANGE: Process of developing organizational capability to a point where it is fully supportive of a new mode of behavior. KEY SUCCESS FACTOR: An element of the competitive posture which is essential for assuring profitability in an SBA. LAUNCHING PLATFORM: Measures taken to prepare a firm for launching a discontinues change. LEGITIMACY OF THE FIRM: Responsiveness of the firm's behavior to public and legal norms. LIFE CYCLE MATRIX: A matrix showing the distribution of the firm's SBAs according to their demand/technology life cycle stages. LONG RANGE PLANNING (LRP): A systematic procedure for long-term goal setting, programming and budgeting based on an extrapolative forecast. LOYALTY: Support given by participant in the firm to actions expected to assure success and survival, in spite of actions that may be contrary to the participant's. MANAGEMENT: Decisive Management which responds promptly and decisively once a challenge begins to affect the performance of the firm. Entrepreneurial Planned management based on creation of novel alternatives. Extrapolative Planned management based on extrapolation of alternatives used in the past. Planned Management which anticipates challenge and prepares its responses in advance. Reactive Management which procrastinates beyond the initial impact and responds only when a challenge begins to have a serious impact on the firm's performance. MANAGER'S MENTALITY: Success formula which he/she uses to guide the firm's behavior. PIMS: A methodology for identifying key success variables based on extrapolation of performance of large samples of similar firms. PLANNED MANAGEMENT OF CHANGE: Process which consists of building a launching platform, managing resistance and institutionalizing the change. POINT POSITIONING: Positioning of an SBA in a BCG or McKinsey matrix at the most probable points on the scales of SBA attractiveness and competitive position. PORTFOLIO: Coherent: A portfolio strategy which can be managed by the same management capability. Strategy: A description of the SBAs in which the firm proposes to participate, enter and exit as well as of the synergies which will be maintained among them. POSTURE: Combination of strategy, capability and strategic investment. PPBS: Planning-Programming-Budgeting System which is a strategic planning system first introduced by Robert McNamara into the US Department of Defense. PREDICTABILITY: The degree of accuracy with which an impending event can be described at the time when a firm must start a response, if the response is to be completed in time for arrival of the event. PRODUCT/SERVICE DIFFERENTIATION: A component of competitive strategy. The way a firm will seek to differentiate its characteristics of products/services from those of competitors. PROGRESSIVE COMMITMENT: A series of strategic moves increasing degrees of commitment. RAISON DETRE: The basis for a firm's legitimacy described by the objectives it is expected to pursue and the rules of the game under which it is expected to operate by society. Strong: A development whose probable impact can be accurately described sufficiently in advance to permit a timely response by the firm. Weak: A development about which only partial information is available at the moment when response must be launched, if it is to be completed before the development impacts on the firm. SOCIAL RESPONSIBILITY STRATEGY: A strategy of the firm addressed to objectives other than economic performance. SOCIETAL STRATEGY: A strategy of the firm for relating it to its socio-political environment (the SlGs). Consists of legitimacy strategy, social responsibility strategy and the preferred rules of the game. SRA: Strategic Resource Area: A source of supply to the firm which is essential to the success of its business strategy. STAR: An SBA which has outstanding attractiveness and in which the firm expects to have an outstanding competitive position. STRATEGIC BUDGET: The budget committed to the strategic development of the firm. STRATEGIC CONTROL: Change in strategy based on evaluation of its future contribution to the firm. STRATEGIC DEVELOPMENT: Process within a firm which lasts from conception to the point of establishment of a new profitable product/service in an SBA. STRATEGIC INVESTMENT: A firm's investment in its strategic posture in an SBA. Includes investments in strategy, capability and capacity. STRATEGY: Logic of evolution of firm's markets, products/services, technology. 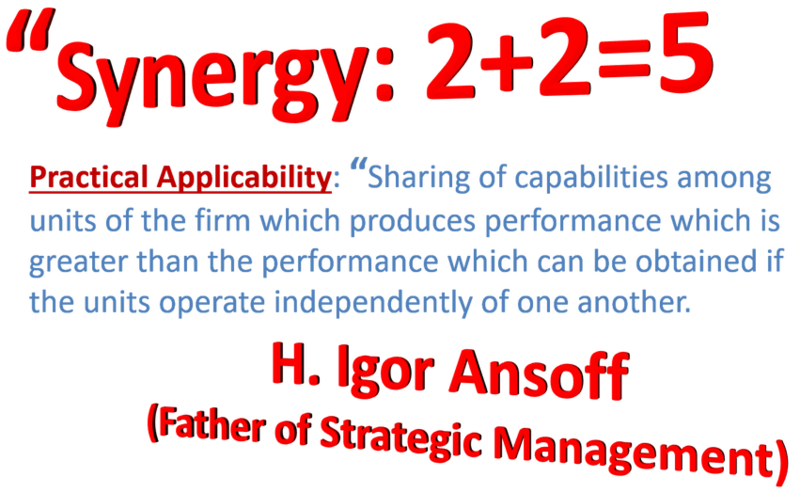 SYNERGY: Sharing of capabilities among units of the firm which produces performance which is greater than the performance which can be obtained if the units operate independently of one another. The "2+2=5" effect. SYNERGISTIC FIRM: A firm in which corporate management seeks to optimize synergy. Fertile: A technology characterized by frequent product innovations. Stable: A technology which remains unchanged from inception to the maturity stage of a demand life cycle. Turbulent: A technology whose life cycle is short relative to the length of the demand life cycle. TURBULENCE: Changeability in an environment characterized by the degree of novelty of challenges and the speed with which they develop. Level: A combined measure of the degree of novelty of challenges and their speed relative to the response time of firms. Negative: Turbulence which poses threats to the firm. Positive: Turbulence which presents opportunities to the firm. WILDCAT: An SBA which is perceived to have a potential which may vary from very profitability to very large loss.